Many people know that Abilene was founded by the Texas & Pacific Railway in 1881, but not as many remember another railroad that served this area for much of the twentieth century – the Abilene & Southern. The A&S was the brainchild of Col. Morgan Jones, a Welsh immigrant who came to the US in 1866, and assisted with the completion of the first transcontinental railroad in 1869. He later helped built the Texas & Pacific, as well as numerous other rail lines throughout West Texas. 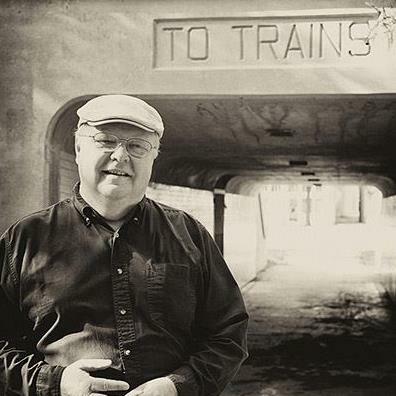 In January, 1909, he began work on the Abilene & Southern. Jones’ original vision was to build a railroad from Abilene through Winters and Ballinger, and then on to points south and west, but for various reasons, those plans were never completed. Ultimately, the line stretched almost a hundred miles, from Ballinger in the south, through Abilene, and northward to Anson and Hamlin. Those who rode the mixed train report that it was common for the passenger coach to be set out on a side track at a station while the train crew went about their switching duties, picking up and dropping off cars. They would then re-couple to the coach and be on their way. It must have really played havoc with the conductor trying to keep the train on schedule! Mixed train service ended in the late 1950s. During Col. Jones’ lifetime, the A&S was operated as an independent railroad, interchanging with the Texas & Pacific in Abilene, and the Santa Fe at Tuscola and Ballinger. 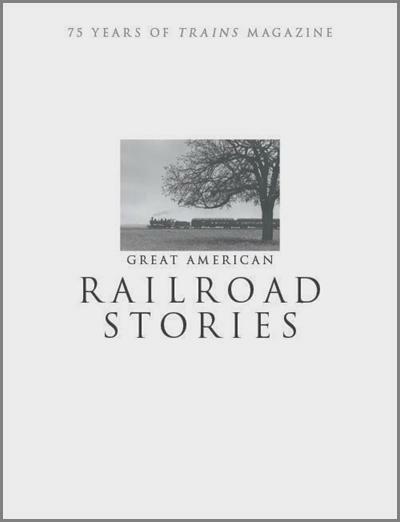 In 1927, however, after the old man’s death a year earlier, the profitable little railroad was bought by the Texas & Pacific, which continued to operate it for decades to come. Alas, economics and the dwindling populations of the towns it served finally caught up with the A&S. The tracks north of Abilene were abandoned in 1937. In 1972, the line from Winters to Ballinger was pulled up. Ownership of the line passed from the T&P, to the Missouri Pacific, to the Union Pacific, which finally abandoned the remaining portion of the line south of Abilene in 1989. Today, only about seven miles remain, interchanging with the Union Pacific and serving industries in east Abilene. Southern Switching Company handles these chores, and their green switching engines can be seen trundling back and forth along the former A&S tracks. There are still a few reminders of the A&S today. The station in Ballinger, with its unique stone twin turrets, is still standing. Drive along the highway between Ballinger and Abilene, and if you look carefully, you can still spot the old right of way. The old A&S Freight Depot has been moved and incorporated into a brew pub on South First. And, when he died in 1926, Welshman Morgan Jones was laid to rest in his adopted hometown of Abilene, Texas. And that is not all. Although the colonel never married and left no direct descendants, his nephews and other members of his extended family remained in Abilene, and continued to use the profits from the A&S – as well as their own fortunes – to benefit the entire community. There’s a huge wing of Hendrick hospital named for a nephew, Percy Jones, and his wife, Ruth Leggett Jones. The planetarium at Abilene High is named after another nephew, Morgan C. Jones. And every non-profit in town is familiar with the philanthropic investments of the Dodge Jones Foundation. So the next time you’re sitting in the comfortable Percy Jones waiting room at Hendrick, think about the old Abilene railroad. The next time you’re driving along US Highway 83 through Winters and on to Ballinger, notice the old roadbed that was there before the highway, and remember the men who built that line, and those who operated her. The next time you’re on Treadaway Boulevard, and you see those little green switchers shoving hopper cars loaded with grain, remember the Abilene & Southern. A&S Engine #20, a 2-8-2 “Mikado” type, August, 1949. 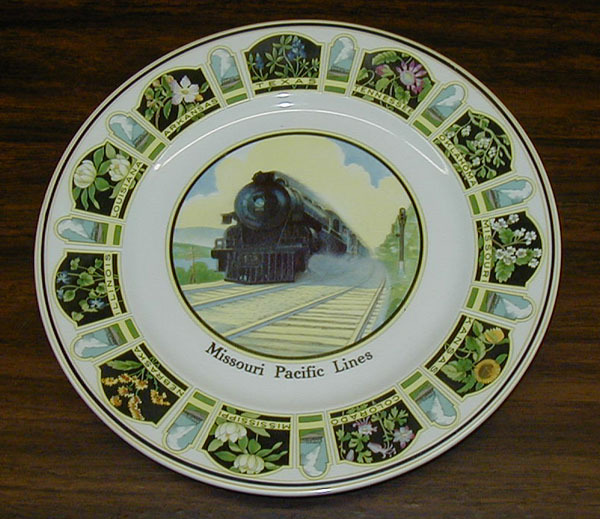 This charger plate was used on dining cars of the Missouri Pacific and Texas & Pacific lines. It featured the state flowers of the states served by those railroads. Back in the day when travel was an adventure and most people got from here to there by rail, one of the highlights of any trip was taking a meal in the dining car. For many, the amazing food and impeccable service was made even better by the pleasure of meeting new people and making new friends while sharing a delicious meal together in the rolling diner. The railroads would often specialize in serving regional favorites that represented the part of the country through which you were traveling. Thus, if you were on board the Union Pacific, you might have one of their famous Midwestern “Prime Steaks.” If you were riding on the Northern Pacific, you could enjoy a “Great Big Baked Potato” from Idaho. Riders going through the Rockies on Missouri Pacific’s “Colorado Eagle” were served delicious rainbow trout. Back in 1916, Mr. M.L. Todd and his business partner, Mr. D.T. McKee, began growing cantaloupes in Pecos, Texas. They contracted with the T&P, and agreed to supply them with cantaloupes for their dining cars. By the 1920s, they were shipping cases of melons via Railway Express all over the country. But of course, as with any perishable commodity, some of the fruit would become overripe on its way to market. That’s where Mr. Edward Pierce enters the picture. Mr. Pierce was a College Station native and a 42-year veteran of the T&P, and he couldn’t stand seeing the melons go to waste, overripe or not. He went to work and came up with a dessert that became a favorite on the T&P dining cars. Happily, in 1992, a writer for the Ft. Worth Star-Telegram, Anita Baker, tracked down Mr. Pierce, who shared his recipe, which we now pass along to you. Serve it to your guests to enjoy a taste of elegant travel from days gone by. Slice cantaloupe in half, deseed and remove rind, reserving all juices. Cut into small pieces. Place melon with juice and water into a saucepan and bring to a boil. Simmer for 5 minutes, stirring often. Mash the cantaloupe as it heats. Mix sugar and flour and slowly add to hot mixture, stirring constantly. In a large bowl, beat egg yolks; add a little water to yolks. Add a little of the cantaloupe mixture to egg yolks in order to heat yolks gradually. Stir egg yolks mixture into cantaloupe mixture. Add butter and nutmeg, stir until butter melts. Continue cooking, stirring, until thick and creamy. Cool and pour into prebaked pie crust. To make meringue, beat egg whites until frothy. Gradually add sugar, continuing to beat until stiff peaks form. Add vanilla or other flavoring. Spoon onto pie, spreading to crust edge to seal filling in. Bake at 325° for 15 to 18 minutes, until nicely browned. Friendships are formed through experiences shared together, whether it’s a meal, a piece of pie, or something else. Because of their proximity, neighbors have opportunities to share experiences and work with each other to build a stronger, safer community. Like passengers on a train, we will find that our journey is more interesting and pleasant as we make friends along the way.